Internet Advertising for Homosassa and all of Citrus County. Are you looking for more business? We have the traffic to deliver you hundreds of visitors and potential customers! We can guarantee you a certain amount of targeted traffic depending on your type of business! If you have a Homosassa, Crystal River or Citrus County area business, call us now and get a quote. Our current advertisers renew their ads every year for good reason. We can potentially double or triple your website traffic and, at the same time, increase business! A quiet little fishing village found hidden along the Florida Gulf Coast, Homosassa is that and so much more. The commercial fishing has all but retired over time for various reasons. However, it’s old florida charm still remains and it is still a popular vacation and recreation area, thanks to the beautiful Homosassa River and it’s proximity to the Gulf of Mexico. Swim with manatees in the wild… Enjoy a thrilling river cruise to the natural habitat of the Crystal River Manatees. Your group will embark on a breathtaking tour to the clear natural springs and then play in the water with our gentle friends. We provide only private manatee tours for your group, while other tours pack you on a boat with several other groups. Capt. Greg has over 25 years of experience. 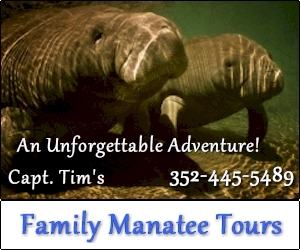 His Manatee Adventure offers the most enjoyable and educational tour available. All gear included. 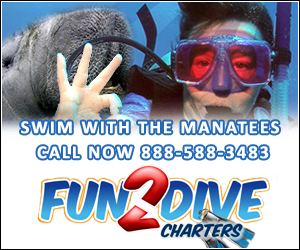 Swim with Manatees in Homosassa or Crystal River Florida. The most experienced manatee tour guides in the business will take you on an unforgettable tour where you’ll get up close and personal with the manatees. Our full day, all-inclusive manatee tours can be enjoyed by the whole family and no experience is needed. Not only will you spend all day with the manatees, we will educate you about the manatees during your tour. 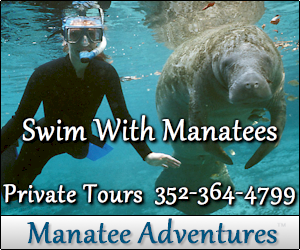 Manatee Tours Conducted 7 days. TOUR PRICE includes all gear needed to swim with the manatees. Exciting manatee tours in Homosassa & Crystal River. Our manatee tours provide unforgettable fun for the entire family! Our tour boats are carefully equipped for your comfort and enjoyment. Join us as we embark on a wonderful adventure to the clear spring-fed waters and popular habitat of the Florida Manatee. Our tours are designed to provide the most enjoyable memories for your group or family. Walk-ins and last minute requests are welcome. We are approximately 70 miles North of the Tampa, St. Petersburg area or 50 miles South West of Gainesville Florida, right on Florida’s Gulf Coast. Captain Shane Fussell is a popular local fishing guide and a sixth generation native Floridian who has been fishing our gulf waters since the age of three. If anyone knows how to find and catch fish in our area it’s Capt. Shane. Capt. Shane’s specialty is fishing for redfish, trout, tarpon, mackerel and sharks in Homosassa and Crystal River waters. Other typical catches include cobia, tripletail, sheepshead, grouper and snapper. Seasons vary. Scalloping is another popular trip that Capt. Shane offers. The scalloping season runs from July 1st through September 10th. Book early for best rates & times!